In 2017, of children aged 0–12 years, 1 261 041 children (or 31.3 per cent) attended Australian Government Child Care Benefit approved child care services, an increase of 3.3 per cent from 2016. In 2016, of children aged 3–5 years, 514 028 children were enrolled in a preschool program. Of children aged in the state-specific year before full time schooling, 288 369 children (or 92.4 per cent) were enrolled in a preschool program. Of Aboriginal and Torres Strait Islander children aged in the state-specific year before full time schooling, 90.4 per cent were enrolled in a preschool program. At 30 June 2017, 73.4 per cent of National Quality Framework approved services with a quality rating were rated as meeting or exceeding the National Quality Standard — up from 70.4 per cent at 30 June 2016. Total Australian, State and Territory government recurrent and capital expenditure on early childhood education and care services was $9.4 billion in 2016‑17, compared with $9.2 billion in 2015‑16. Governments aim for ECEC services to meet these objectives in an equitable and efficient manner. 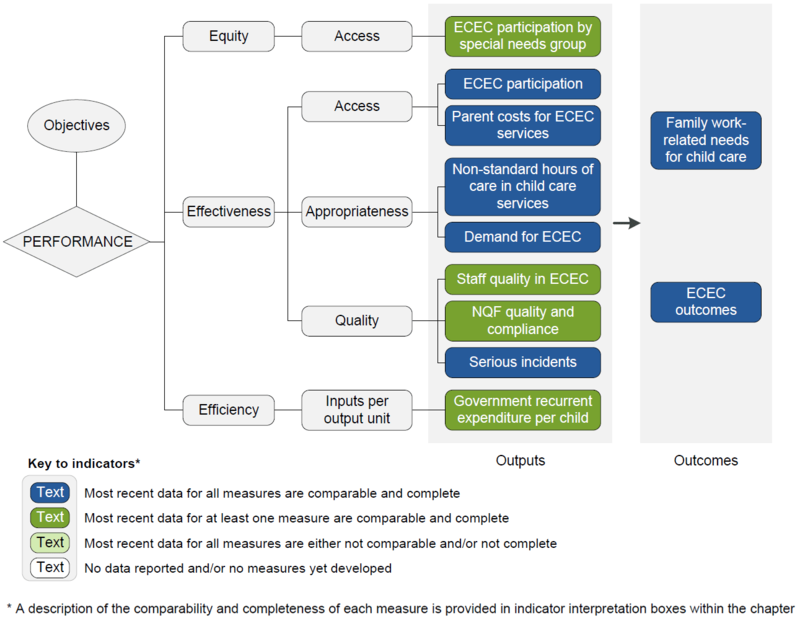 The performance indicator framework provides information on equity, efficiency and effectiveness, and distinguishes the outputs and outcomes of ECEC services. The performance indicator framework shows which data are complete and comparable in the 2018 Report. An overview of the Early childhood education and care (ECEC) performance indicator results are presented. Information to assist the interpretation of these data can be found in the indicator interpretation boxes in the ECEC chapter and attachment tables. Children using child care, by special needs group — Proportion of 0–12 year olds attending Australian Government Child Care Benefit (CCB) approved child care services who are from targeted special needs groups (Aboriginal and Torres Strait Islander children, children from low income families, children with disability), compared with the representation of these groups in the community (per cent). Preschool program participation, by special needs group — Proportion of children aged 3–5 years enrolled in a preschool program who are from targeted special needs groups (Aboriginal and Torres Strait Islander children, children from regional areas, children from remote areas), compared with the representation of these groups in the community, 2016 (per cent). These data and caveats for these data are available in chapter 3 and attachment 3A. * Indicates the estimate or proportion has a relative standard error between 25 per cent and 50 per cent and should therefore be used with caution. .. Not applicable. – Nil or rounded to zero. np Not published.